D.M. College, Moga has advertised in the TRIBUNE newspaper for recruitment of Assistant Professor Plus Clerk jobs vacancies. Interested and eligible job aspirants are requested to apply within 21 days from 16th January 2019. Check out further more details below. About College: Dayanand Mathra Dass College, Moga was started in 1926 by Rai Bahadur Dr.Mathra Dass Pahwa, THE Awardee of "PADAM VIBHUSAN" and the eminent eye surgeon, philanthropist and educationist in the Sacred memory of the Maharishi Swami Dayanand Saraswati. It is one of the eminent and excellent institutions of the State. It has been the envy and emulation of the neighboring institutions for many a decade. It has been holding aloft the banner of light and learning for the last eighty two years and has been serving Moga and its surrounding areas of Punjab, Haryana and Himachal with a singleness of purpose and devotion in the sphere of higher education. 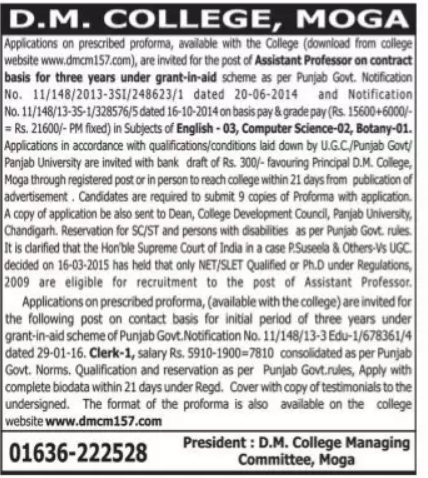 Application Fee: Rs.300/- as DD in favour of The Principal, D.M.College, Moga. How to Apply: Interested candidates are requested to send their application in prescribed format (09 copies) with copies of certificates and recent PP size photo to the postal address provided below or submit in hand to the college.